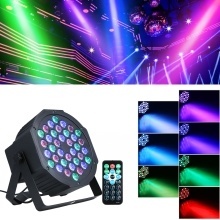 The 24W 36-LED RGB mini stage par Light produces ultra bright colorful light effects, creating a variety of amazing lighting effects for stage, bar, pub or party lighting. Supported sound activated, auto-running, DMX512, master-slave, remote control 5 flexible control. Don&apos;t hesitate to buy now! 100% brand new and good in quality. 36 * high bright LEDs produce ultra bright colorful light. Convenient remote control for setting different lighting effects, adjustable brightness. 4 flexible control modes: Supported auto-running, sound activated, DMX512 and master-slave modes, be easy to use. Built-in fan for better cooling, better performance. Creates a variety of amazing lighting effects for stage, bar, pub or party lighting. Small and light, can be easily carried where party is held and takes up little space. This item is non-waterproof, please use it carefully.